Just a quick message, if there are many UK RX8 owners? I know there is a uk site but the site charges and I don't have paypal and this club seems to have all the information needed! Any owners living around London, South london? East London here, there are a few of us around there. If you're on facebook then look up RX8 UK. I don't go on the UK Owners Club site either (they banned me! ) but there are quite a few 8 owners on MazdaRotaryClub.com and we have events round the London area - you just missed this months Dartford meet but there's one the second Tuesday in every month. As g4crx says check out Facebook. I've been to the Dartford meet, a few UK Owners Club member go there regularly. Yeah we get quite a good RX-8 turnout - normally manage to out number the RX-7's. Not sure who that request is aimed at but my details are in my public profile. just bought a 2004 rx-8 (231). Really really happy with it. Never had so much fun on the road! I'm picking up my rx-8 tomorrow, can't wait. I'm so excited I may cream myself. Oh, and hello from the Midlands! 1. Replaced front corners with the JDM/E-in-a-circle clears w/amber bulbs. 3. Tweaked the alignment of the headlights, but I'm sure this will have to be addressed by a shop once I get there. Should I utilize the base auto hobby shop for the MOT? I found a website for Mildenhall MOT Station; is that any good? I'd appreciate any assistance you can provide. Hello another UK Member here & just joined this Forum today. I am a Active Member of www.rx8ownersclub.co.uk & thought I check you all out. Welcome to the World's largest RX-8 forum! I used to be a founder-member of the 'owners' club, until I wouldn't pay the dues! Yeah they're not keen on that - along with many other things. Are any of you UKers going to JapShow this weekend? i'm from the uk. this forum is good!! yeah...agree....nice to see more brits on this forum!! nice colour u hav on ur car dave! Thought i'd pop in and say hello, been a lurker on here from quite some time. 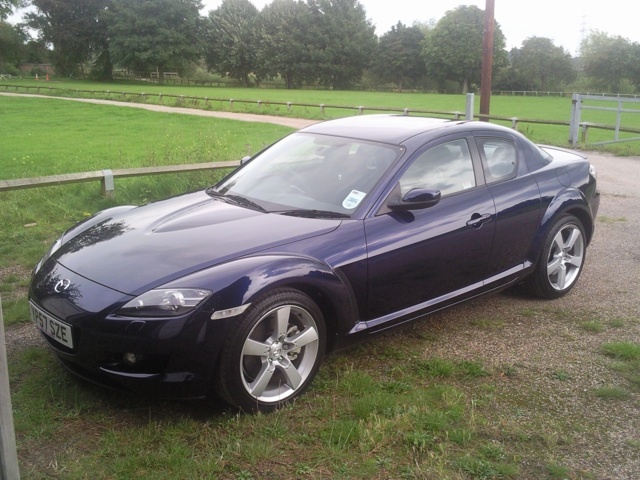 I'm from the N/W sunny BOLTON, i'm nomally on 2 wheels the RX8 is the family and rainy day car, and a dam fine one it is,except for the rusting of various parts. Im from up north too slidey, im in blackburn, we get even less sun than you i think!! lol. Anyways hi everyone, had rex about 4 and a half months and she is brill! !